Pros: Quick to set up and pack away, made from strong canvas and steel, easy to keep clean, can fold up to a small, easily transportable size. It can be used indoors and outdoors. Cons: Unsuitable for babies or children who roll around a lot in their sleep. Some people report that the fasteners for the canvas top can break. The Regalo My Cot Deluxe Portable Bed is a fantastic, flexible, option for families that want a portable travel bed for toddlers and preschoolers. Not an inflatable toddler mattress like many of it’s competitors, the Regalo is a fold out stretcher that is incredibly quick to set up and keep clean, making it great for outdoor and indoor use alike. Families that need a portable travel cot that is extremely quick to set up, very portable, strong and long lasting. The construction quality is high and it is made from durable materials. This mean that the Regalo Portable Bed is an ideal candidate for those who need a bed that can withstand different environments, from a motel room to the beach, while keeping kids comfortable and safe. The Regalo Cot needs assembly to use. It is very easy to set up and fold away when no longer in use. Assembly is quick and can be done in less than a minute. This is much faster than inflating and deflating an air filled mattress. Cleaning is very easy. The cot cover slides off and is machine washable. The canvas top and steel frame can be washed down with water and dries quickly. Toddler travel beds that require assembly do not come any more portable than the Regalo. Coming with a carry bag for storage, the total weight is a touch over 6lb, and once folded up is just 2 feet long and approximately 8in thick. It is easy to carry in a suitcase or the trunk of your car. Only an inflatable toddler travel bed is more portable. The canvas cot liner is firm and stable. Combined with the included fitted sheet the cot provides an excellent level of comfort. The cot remains stable and supportive and does not move or shift when a child moves around while sleeping. Some parents have added foam mattress toppers, cut to size, under the fitted sheet for increased softness and comfort. The Regalo My Cot Bed can support children up to the weight of 75lb and a height of 52 inches and is ideal for children between the ages of 2 and 5. Children younger than two have used the Regalo Cot but because it does not contain children it won’t be suitable for all such younger kids – see our guide to see if a toddler bed is suitable for your child. The Regalo My Cot for kids is safe. The steel frame is light yet very strong when assembled, meaning there is no chance of collapsing or sagging. The cot is raised seven inches off the ground, so if a child does roll out they are unlikely to hurt themselves. The top of the cot yields a little when slept in, meaning that your child will be in a slight concave, decreasing the chance of rolling out. The canvas top is double stitched for strength. However, because children are not contained, this bed is not ideal for your child if they move a lot during sleep. The Regalo Portable Bed is 48 inches long by 26 inches wide when assembled. It comes with a machine washable cotton fitted sheet and carry bag. Extremely quick and easy to set up and pack away. Not suitable for babies or children who need containing. Some people have experienced problems with the fasteners that hold on the canvas top, requiring them to contact Regalo for replacement. Click here to read more reviews of the Regalo My Cot Deluxe Portable Bed. 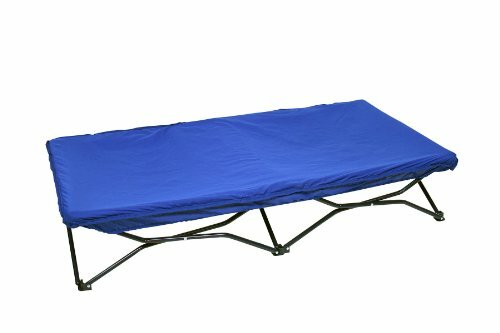 The Regalo Portable Bed is lightweight, quick and easy to set up. It is a very durable toddler travel bed. The canvas and steel construction materials means that it suitable for use in both indoor and outdoor situations, and can be used for toddlers’ naps when camping, in the park or even at the beach. It’s small fold up size makes transportation and storage easy. Still unsure which travel crib/toddler bed to buy? Check out our buying guide.